Regiment/Catrawd: Royal Field Artillery "D" Bty. 60th Bde. Ref No Grave or Memorial / Rhif cyfeirnod bedd: III. B. 35. It is not easy to unravel John Edward Jones’s story as the facts on the index card in the Flintshire Record Office do not tally with the military information online. There were many Jones families in Newmarket at the time of the First World War and more than one John Edward Jones. The man whose records are online was born in Newmarket, enlisted in Ferndale Glamorganshire and fought at Gallipoli where he lost his life on the 7th of January 1916. He was a Gunner in the Royal Field Artillery / Royal Horse Artillery. 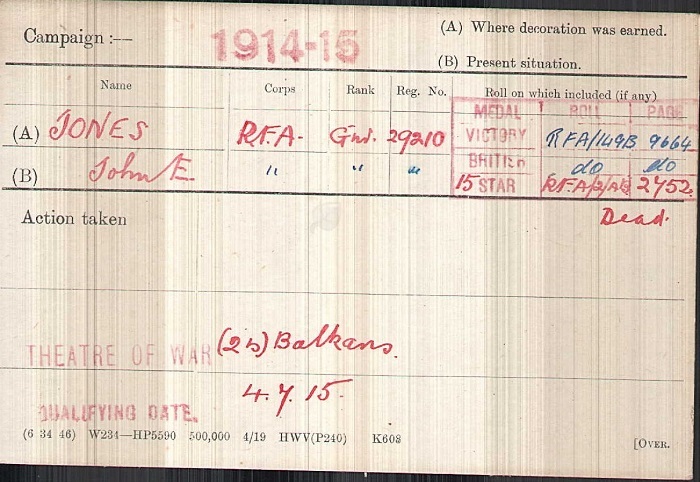 He died in the 1st Canadian Stationery Hospital, Mudros and is buried in the Portianos Military Cemetery, Greece. The information on the CWG website regarding John Edward Jones’s age is ambiguous. On the main page it gives his age as 40 whereas he is recorded as 34 years old on one of the headstone documents! How poignant that Welsh inscriptions commemorate these men who lie so far from home. So who was John Edward Jones? According to the information on the CWG website, his parents were Owen and Margaret Jones. He had several siblings although I believe he was the eldest. At the time of the 1911 census his parents and younger siblings were living in Mostyn Terrace, Newmarket – next door to the Black Boy Inn. This was occupied by another Jones family. Were they related? This family had a son, Robert, whose index card states he was “still serving” in 1919 when the cards were completed. Robert’s regimental number was 8531…… the number ascribed to John Edward Jones on his index card. This may partially explain the confusion I encountered when researching this soldier and why the Black Boy Inn was given as his address on the index card.